Chick-fil-A and gay marriage. Our economy is falling apart, Syria's chemical weapons may fall into the hands of Al-Qaida, but the statements of a conservative business owner take top spot in the news cycle. What's the best defense against a crazy person with a gun? Having guns in the hands of the sane folks in the crowd. But that kind of logic doesn't penetrate the mind of those who believe the answer is always more government, more regulation, more control by those in power. How naive are we becoming? I know....years of government public schools have had their intended effect. Whittle remains one of my favorites. Thanks to Moonbattery for the video. From The Real Revo comes word of a true danger to Americans that must have immediate attention. That’s how many Americans were killed by automobiles in the US during the first quarter of 2012. That is 910 more in the first three months of 2012 than in the first three months of 2011. This tragedy is another grim reminder that cars are the enablers of mass killers and that our nation pays an unacceptable price for our failure to keep cars out of the hands of dangerous people. NHTSA said the rate of traffic deaths per 100 million miles of vehicle travel increased substantially. For the first three months of 2012, the rate increased significantly to 1.10 fatalities per 100 million miles traveled, up from 0.98 fatalities per 100 million miles in the same period last year. NHTSA said it estimates 7,630 people died in vehicle crashes in the first three months, up from 6,720 in the first quarter of 2011. Cars kill 12 people in America every three and a half hours, 24 hours a day, seven days a week. At what point will be ban semi-automatic assault automobiles? Why don’t the police just go on strike until the assault cars are banned? Do you realize that there is no federal licence required to own an automobile? There isn’t even a background check. People under the age of 18 are allowed to use automobiles unsupervised. We must work to reform the auto industry by enacting and enforcing sensible regulations to reduce automobile violence, including regulations governing the auto industry. In addition, we should represent victims of automobile violence in the courts. We must work to educate the public about car violence through litigation, grassroots mobilization, and outreach to affected communities. Together we can end the death and destruction automobiles cause in America. Too good. H/T to I Own the World for the pointer. Police have released information that the shooter, James Holmes, used the road to get to the theater. Hey, we all need help from Uncle Sam. 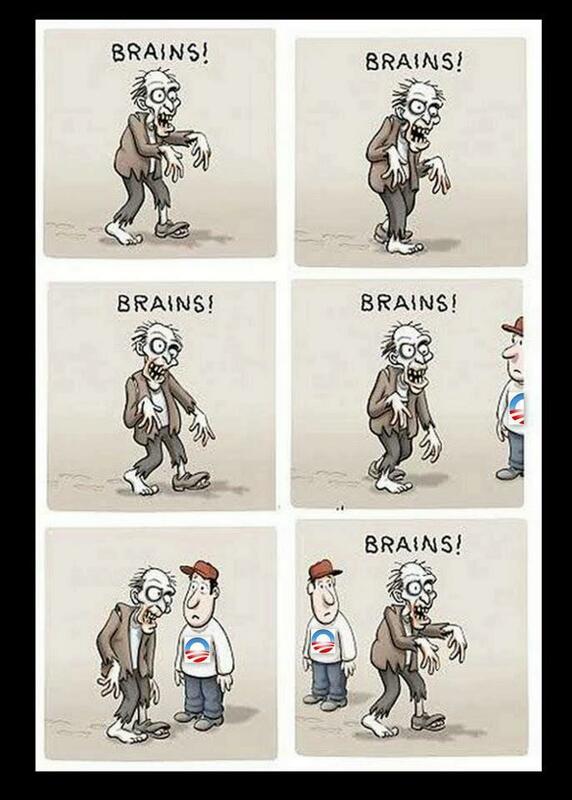 Unfortunately, the typical Obama supporter feels rather than thinks. I guess that the White House Kool-Aid just dissolves those brain cells into a gooey mess. Found at House of Eratosthenes. Barack Obama offered condolences today to the victims of the Aurora Theater shootings the best way he knows how – by talking about himself. The president used “I”, “me” or “we” over 20 times and used it as an opportunity to talk about himself and his family. My daughters go to the movies. What if Malia and Sasha had been at the theater, as so many of our kids do every day? Michelle and I will be fortunate enough to hug our girls a little tighter tonight, and I’m sure you will do the same with your children. But for those parents who may not be so lucky, we have to embrace them and let them know we will be there for them as a nation. So, again, I am so grateful that all of you are here. I am so moved by your support. It's all about The One. A few good ones to share. 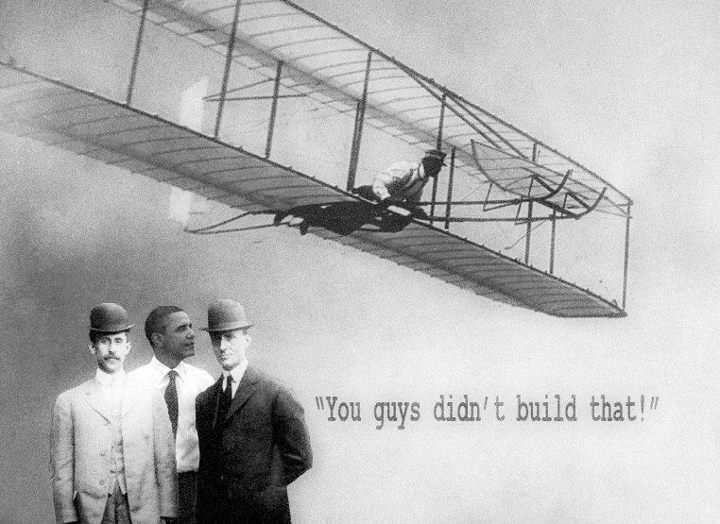 From Jon Lovitz, via You Didn't Build That. Seems that while our President says that he is focused on jobs, the only one he seems to care about is his own. And that of his caddy. Jobs Council meetings in the last six months = ZERO. 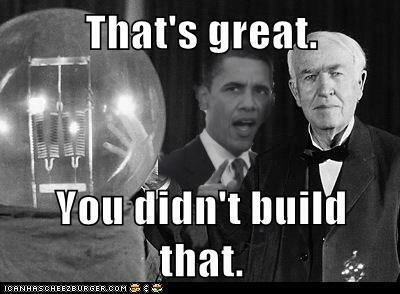 Now, to hammer home this point, day after day, so that the mass of Americans truly learn what Obama believes. What happened in Colorado in the early hours of this morning was not a “tragedy” but a willful act of mass murder. Beyond his age, name, and ethnicity, nobody yet knows who the shooter is, or why he chose to do what he did. In my view, this is a blessing, albeit a temporary one; for, as has been the way in recent years, once his party registration, television-viewing habits, and random scribblings become known to the public, all sorts of hysterical speculation and unlettered accusations will burst forth. Whole groups will be vilified, blame will be apportioned to those many times removed, and the shooter will be partially absolved of blame by those who prefer to see fault in video games or talk radio or political rhetoric or anything else that can be conscripted to explain why terrible things happen to good people. Few will point out that unless someone commits an atrocity in the name of an ideology — Timothy McVeigh, for example — their political beliefs are wholly irrelevant. Even in cases where a killer is motivated by something specific, to draw general conclusions is most often folly. America is not the land of collective guilt, and mass shootings should carve out no exception. It's as if President Obama climbed into a tank, put on his helmet, talked about how his foray into Cambodia was seared in his memory, looked at his watch, misspelled "potato" and pardoned Richard Nixon all in the same day. It's fun to imagine the hand-wringing that must be going on within the White House as staffers try to figure out how to undo the damage their boss has done with his anti-entrepenurial riff. Defining moments in politics are strange beasts. Sometimes they're only recognized in hindsight, while sometimes they throw the train off the tracks before a sentence has been completed. Sometimes their effect can be contained and minimized, while sometimes their effect on the political narrative mestastasizes. This one is very bad for the White House. These defining moments take hold most devastatingly when they confirm what a large portion of the electorate already believes. Taken alone, it seems unfair that a single moment, an unguarded remark or a slip of the tongue can carry such weight. They're often dismissed as "gotcha" moments, but when voters are able to nod and say, "I knew it," these moments stick and do terrible damage. We have witnessed such a moment. The OC had to take some time away from the internet, but is back to keep you posted on what's happening out there. Sorry for the absence, but I'm revved and ready for the run to November. And so should you. Anyone who has seen Elizabeth Warren deal with the Cherokee issue knows the routine — immediately change the subject, answer the question you wanted asked not the question actually asked, keep talking rapidly, and most of all, act as if you have not just been caught in a lie. Notice that when the interviewer reads Warren’s own words back to her contradicting her claim that she does not support single payer, she immediately mentions that she wrote it with two other people — as if that has anything to do with anything, but it was a convenient segue to pretending she was not caught misrepresenting her own position. With all that's been going around elsewhere, it's easy to lose sight of our favorite red-skin (or would that be Crimson-skin). Anyhow, the good folks at Breitbart haven't forgotten Liawatha. Cherokee genealogist Twila Barnes has caught Elizabeth Warren in yet another lie about her false claims of Native American heritage. When Elizabeth Warren's "Aunt Bea," Bess A. Reed Veneck, died in 1999 at the age of 98, Ms. Warren was listed as the "informant" on the death certificate that identified Aunt Bea as White. Line 14 of the death certificate allowed the informant to specificy the race of the deceased. Presented with the option of selecting "American Indian," "Black," or "White," Ms. Warren chose to identify Aunt Bea's race as White. You see, it's OK if a Democrat changes their story. That's "evolving". Look at our president and his composite biography. Whatever fits the narrative, well, that's the new truth. If only Warren has just fessed up in the first place. But it's never the deed, it's the coverup. Just ask Eric Holder. Barack Obama has a seemingly pathological need to change his story whenever the situation calls. 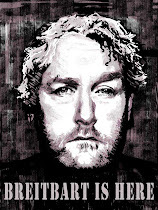 In a continuation of their series "The Vetting", Breitbart turns to Obama's stance regarding private equity. President Barack Obama has attacked Gov. Mitt Romney's record in the private equity industry as CEO of Bain Capital. But ten years ago, as he struggled to raise funds for his long-shot U.S. Senate campaign, then-State Senator Obama decided to embrace the private equity industry and its wealthy Chicago political donors. At one point, Obama even sponsored a resolution in the Illinois Senate calling calling private equity firms like Bain "the best opportunity for long-term economic vitality" and for "the creation of jobs." Obama's campaign ads dismissively compare Romney's work at Bain to that of a "vampire" draining jobs and money from vulnerable companies and workers. After pushback from a handful of pro-free market Democrats in late May, the President himself publicly defended his campaign's attacks on private equity firms like Bain. But records from Obama's time as a state senator in Illinois, along with recollections of those who worked with him, present a very different stance. 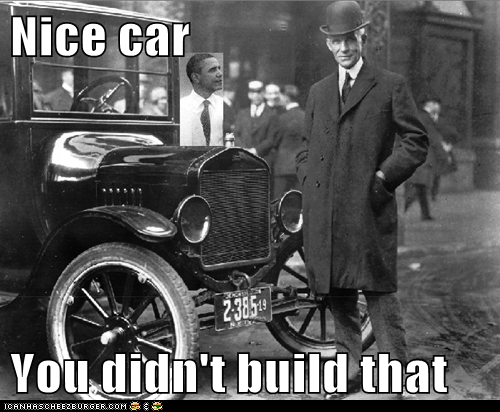 They indicate that Obama worked hard to position himself as a strong supporter of the venture capital industry. Obama attended industry social functions and used his position in the state senate to propose bills consistent with the legislative goals of the venture capital industry in the state. When it suits him, he's for private equity. When he needs the money, he's for it. But when it then becomes expedient to be against it, Obama does a faster 180 than anyone since John Kerry. The Department of Justice is asserting that the governor of Texas, as well as state legislators, have no executive or deliberative process privilege to shield documents -- even as Eric Holder and President Obama assert executive and deliberative process privilege to shield documents from Congress in its investigation of Fast & Furious. It’s clear, when one compares the Justice Department’s position on executive and deliberate process privilege in the Texas voter ID litigation with its position on the privilege in the congressional investigation of Operation Fast and Furious, that neither Eric Holder nor Barack Obama want the same rules applied to them that they would apply to the governor of Texas and members of the state legislature. Yep. Just three days after the historic SCOTUS decision and there's a story from major leaks on the deliberations and voting. The Volokh Conspiracy has details on the CBS News reporting from Jan Crawford in three great posts HERE, HERE and HERE. I am told by two sources with specific knowledge of the court’s deliberations that Roberts initially sided with the conservatives in this case and was prepared to strike down the heart of this law, the so-called individual mandate, of course, that requires all Americans to buy insurance or pay a penalty. but Roberts, I’m told by my sources, changed his views deciding to instead join with the liberals. This is amazing. Does anyone know how to spell Earl Warren? The primary tactic of the Obama administration, whether trying to govern or just to campaign, is to lie. Flat out lies. Nice to see that Mitt isn't letting it slide. Now, it's up to us. Plain and simple. Flopping Aces brings back a 2008 story from the Boston Globe about slumlords and federal subsidies in Chicago. And among the players mentioned....Valerie Jarrett. Yes, the same Valerie Jarrett who had over 100 Chicago policemen assigned to her daughter's wedding. Read the whole thing. The cronyism is inbred in this group.